We know, the LG V35 just came out, but the world of mobile phones moves quickly, and we’re starting to see a heap of LG V40 rumors. Specifically, the forthcoming LG V30 successor is due to get five cameras, according to a report from Android Police. Now, while we still have no idea what the cameras will be, or where they’ll be – we’re going to go ahead and assume that two of them will be in the front, with one of them being an IR camera – allowing for facial unlock. The other three however, will likely be on the back, as a triple lens camera like we’ve seen on the Huawei P20 Pro. This triple lens camera seems to be a trend when it comes to smartphone rumors in 2018. And, while we’ve only seen a triple-lens camera on the Huawei P20 Pro, that camera was so good, we can see why it’s popular. We just can’t wait to see more phones adopt this triple-camera design – it’s already been rumored that the Samsung Galaxy S10 will feature such a camera array. The LG V40 will feature a notch that you can turn off, much like the LG G7, according to today’s report. With the inclusion of this notch, it would give even more credence to the idea of a Face ID-esque biometric login system. 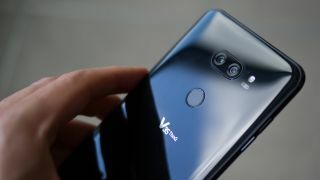 However, that same source reported that the LG V40 will still include the fingerprint sensor on the back, much like the LG V35 and G7, so will it include 2 forms of biometric login? Or, will the two lenses in the front of the phone instead be used for a high-end front facing selfie camera? This will all apparently be powered by a Qualcomm Snapdragon 845 processor, which shouldn’t surprise anyone who’s been paying attention to mobile phones in 2018. Just about every flagship Android phone has this chipset. Everything points to the LG V40 releasing in late 2018, which makes sense because the company’s V-series phones tend to get announced in late September.